s John Robson and Jack Stillinger note in their introduction to volume 1 of the University of Toronto Press’s magisterial edition of the Collected Works of John Stuart Mill (1963-91), Mill’s posthumous-published Autobiography (1873) is unlikely to satisfy those hoping for “confessions,” “self-celebration,” social anatomy,” or “psychological states” (CW 1.vii-viii). Mill, himself, promises only “some record of an education which was unusual and remarkable . . . the successive phases of [a] mind which was always pressing forward . . . [and] a desire to make acknowledgement of the debts which my intellectual and moral development owes to other persons” (CW 1.5). On these subjects he arguably delivers; on more personal revelations he remains largely silent. Francis Mineka, joined eventually by Dwight Lindley, shed some additional light on Mill’s interpersonal relations through their edition of Mill’s letters, which occupy volumes 12-17 of the Collected Works (volume 32, Additional Letters, appeared later and was edited by Marion Filipiuk, Michael Laine, and Robson). Even here, though, Mill is rhetorically cautious, almost always reserving something under the guise of intellectual civility. For instance, his disagreement with French positivist Auguste Comte, surely among the most pointed of Mill’s epistolary career, remains tightly confined to the logical and ethical ground from which Mill perceives the insufficiencies of Comte’s opinions about women and compulsory philanthropy, respectively (CW 13.599-601, 13.691-98). Mill ultimately published the substance of his objections in Auguste Comte and Positivism (1865), reprinted among the Essays on Ethics, Religion and Society that make up volume 10 of the Collected Works, but his less polished opinions of his intellectual colleague and former friend have been largely unavailable. The recent decision to digitize the handwritten marginalia found throughout the personal library Mill left behind at his house in Blackheath, London, has made these and many of Mill’s unvarnished reactions to numerous other nineteenth-century and antecedent writers and thinkers accessible for the first time. Mill Marginalia Online — which aspires to digitize and render fully searchable all of the handwritten marginalia, including both nonverbal marks and verbal annotations, in Mill’s library, currently held as a special collection at Somerville College, Oxford — has also begun to reveal new facets of Mill beyond his carefully cultivated persona of public intellectual. 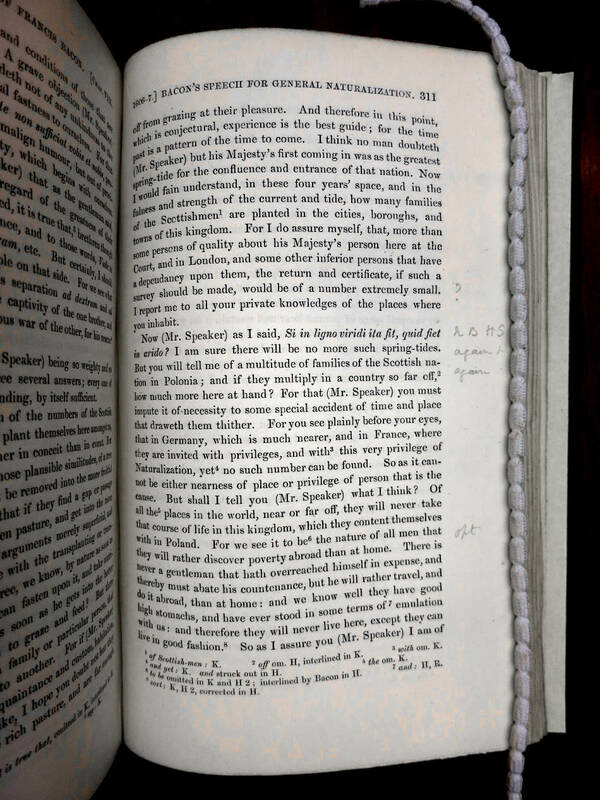 With approximately 20% of 1674 individual volumes and 45 unbound article and pamphlets added to the database so far, five distinct versions of Mill have begun to emerge from the flyleaves, endpapers, outer margins, and interlinear spaces on which he recorded his first, private responses to what he was reading. 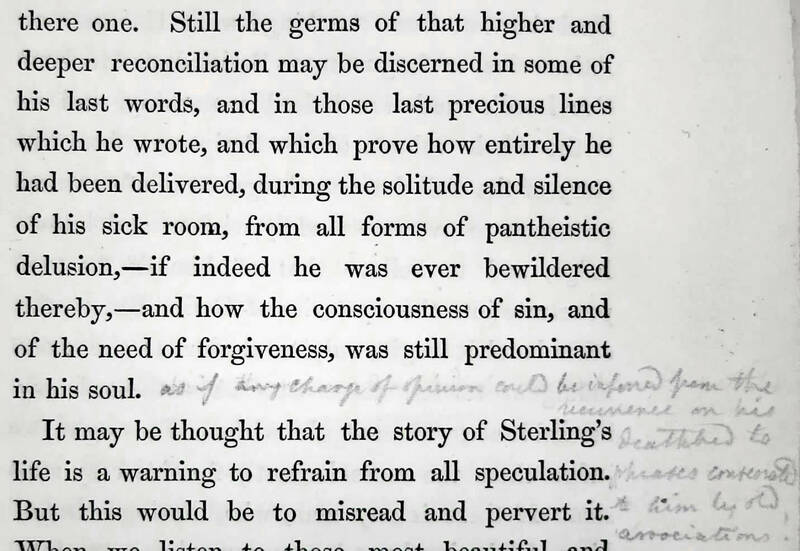 Given Mill’s work as de facto editor of the London and Westminster Review (1836-1840), the presence of marginalia that highlights Mill’s exacting eye for editorial detail is perhaps not surprising. The extent of editorial corrections made in Mill’s hand throughout the collection, and the fact that he felt perfectly competent to fix copyediting mistakes in English, French, Latin, and Greek, may be less expected however. 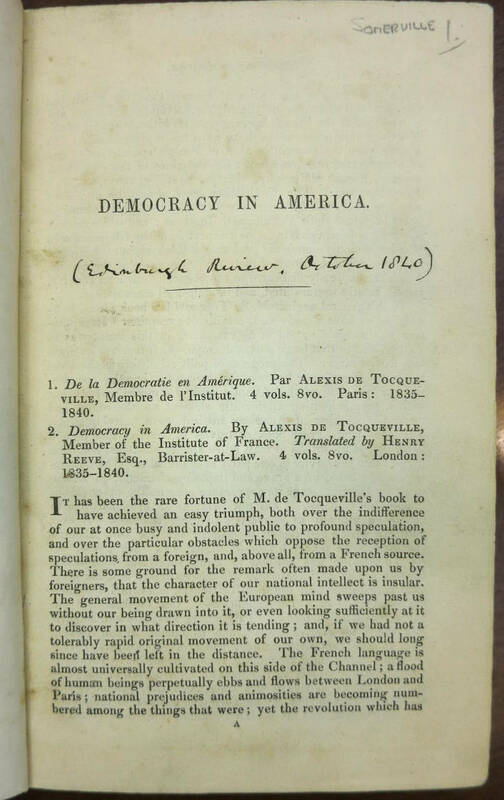 The following two images reflective of Mill as editor are both taken from an offprint of Mill’s original, 1840 review of Alexis de Tocqueville’s Democracy in America; the article is bound, along with fourteen others, in a volume entitled simply J. S. M 1840-1858. The meticulous notation of the original publication venue featured in the first image may have been for Mill’s own records. 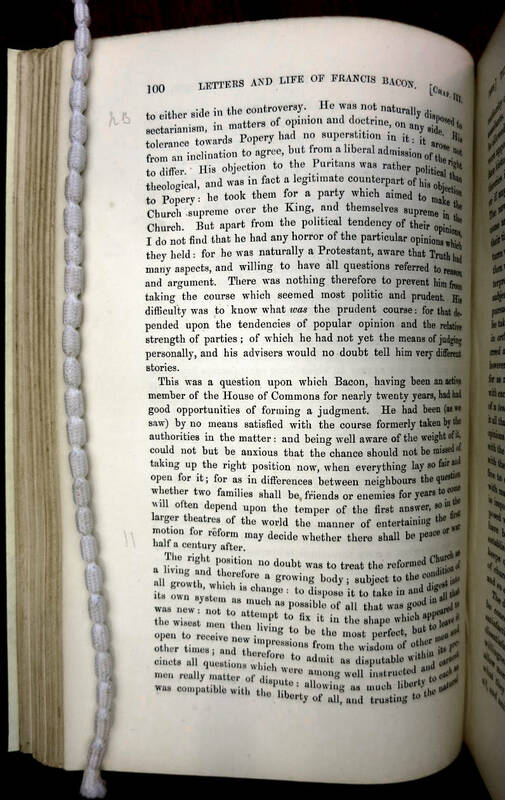 However, the interlinear recasting of the top of p. 11 almost certainly reflects Mill’s editorial impulse to revise his own work to its best advantage before republishing an expanded version of this review in Dissertations and Discussions (2nd ed 1867; reprinted in CW 18.153-204). In addition to serving as the editor for the London and Westminster Review for nearly four years, Mill was also a frequent contributor to the Westminster Review, Fraser’s Magazine, the Edinburgh Review, Tait’s Edinburgh Magazine, and other periodicals. In his capacity as essayist and reviewer, he frequently called other writers to task for their lapses of logic, shortcomings of method, and choices of evidence. However, none of his published works come close to level of excoriation found in Mill’s personal copy of Ralph Waldo Emerson’s Essays (1841). Frank Prochaska has written about these marginal annotations at length for History Today (vol. 63, 2013), arguing that their importance lies, at least in part, in correcting subsequent scholarly assumptions that because Mill published nothing about Emerson he did not know the American’s work. 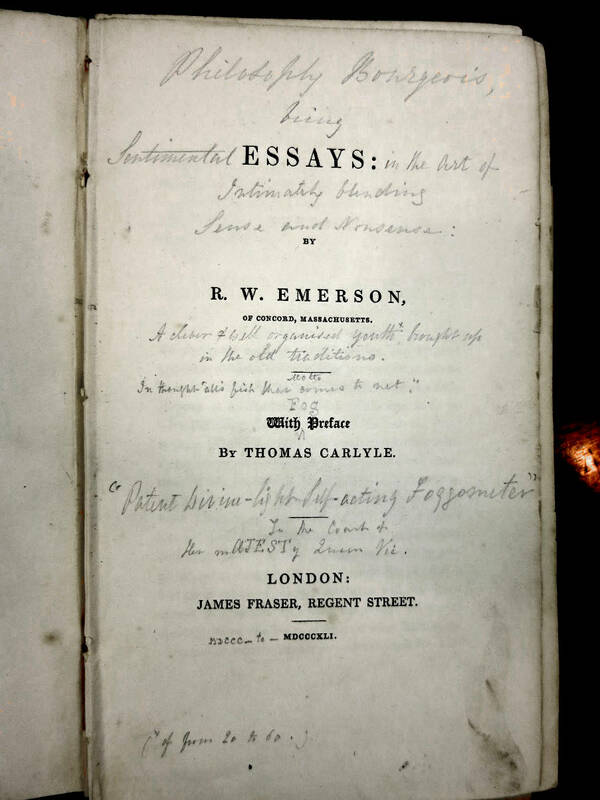 As it turns out, having facilitated Emerson’s initial meeting with Thomas Carlyle in 1833, Mill took an interest in the London edition of Emerson’s Essays, which included a preface by Carlyle. As evidenced by the much-altered titled page reproduced above, he found them “Philosophy Bourgeois, being Sentimental Essays in the Art of Intimately Blending Sense and Nonsense,” complete with “Fog” Preface by the “Patent Divine-light Self-acting Foggometer” himself, Carlyle. A creative compilation of his marginal notations, this summative judgment grew out of Mill’s initial reactions, such as that on p. 170, which judges the deeply earnest Emerson a “Funny man!!!!! !” and “Funny fellow!” while wondering “Is this Philosophy?” — evidently not. A less critical and more deferential Mill emerges from the margins of his copy of The Works of Francis Bacon (1857-74). Mill seems to have approached Bacon’s Works as a researcher eager to find passages suitable for his own future reference. The result was hundreds of marginal scores, double scores, “NB”s, and “HS”s (presumably shorthand for “Holy Scripture,” since it appears beside biblical references). Mill occupies the margins of Bacon’s Works both literally and figurative, noting his predecessor’s experience and opinions without evaluating them as he does in other, more recent authors works. Mill’s brief but numerous marks and annotations begin to appear with startling frequency in the tenth volume, which contains a portion of Bacon’s Life and Letters focused in particular on the inner workings of England’s government. Pages 100 and 311, reproduced above, are typical examples. 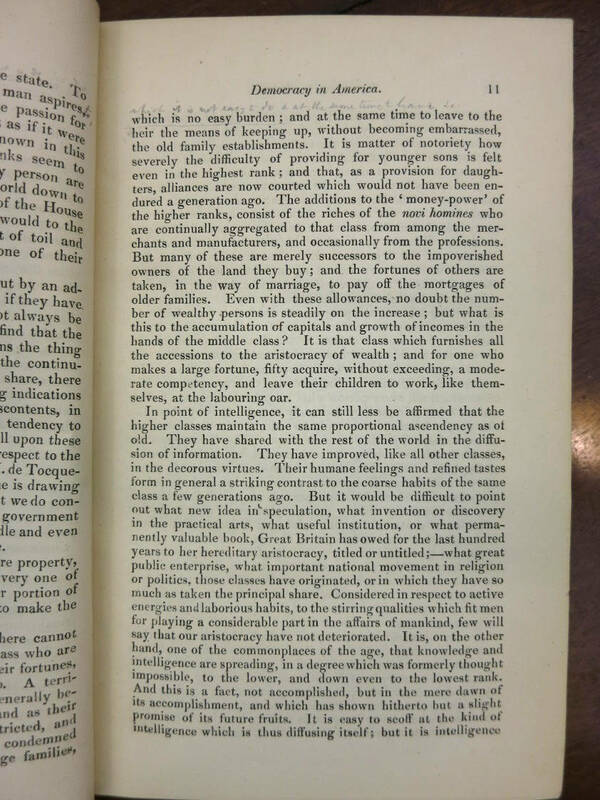 This volume was published in 1868, also the final year of Mill’s service in Parliament, and the coincidence of subject matter and date suggests that Mill may have been seeking passages to use in his own later Public and Parliamentary Speeches (CW, vol. 28 and 29), his posthumous Three Essays on Religion (1874, CW 10.369-489), or another late work. 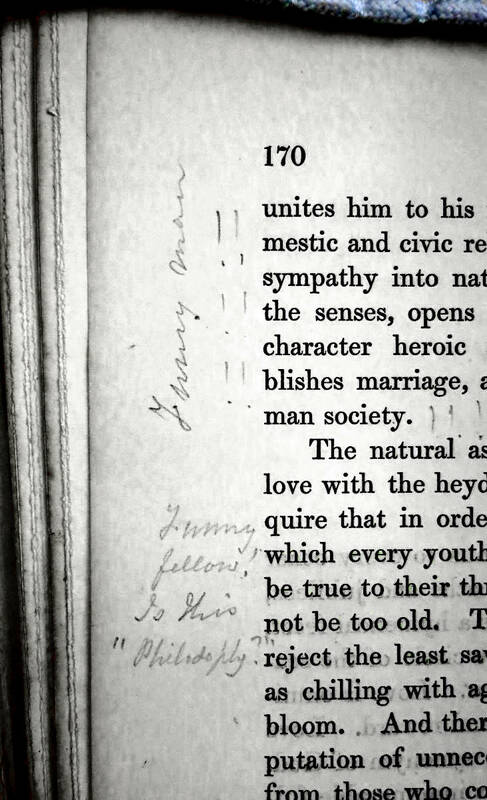 Rare but humanizing are the examples of marginalia that reveal Mill reading as a friend. Among his most poignant friendships was that with John Sterling, whom Mill first encountered at the London Debating Society in 1828. After his January 1829 speech on Wordsworth revealed that they had common sympathies, Mill writes that with “Sterling I soon became very intimate, and was more attached to him than I have ever been to any other man” (CW 1.159). Sterling’s death in 1844 was a hard blow for Mill, who read with personal interest the posthumous two-volume edition of Sterling’s Essays and Tales edited by Julius Hare in 1848. Hare’s lengthy and rather pious biographical preface to volume one occasionally sparked Mill to annotate in defense of the friend he so fondly remembered. “N.B.  written when Sterling was 21.” may reflect Mill’s effort to call his friend to mind as he was in 1828, when this piece was first published in the Athenaeum, or it may imply a critical judgment that Theodore Elbert is a youngster’s work, or some combination of the two. In either case, it stands as evidence that Mill’s intimacy with Sterling did not end with his friend’s premature death. Mill’s first stated goal in his Autobiography concerns his almost incredible childhood education. Much has been written about the ambitious curriculum developed by his father, utilitarian philosopher James Mill, but less has been said about thinly circumstantial evidence for Mill’s ultimately mental-breakdown-inducing experience of home schooling: Mill’s own obviously formidable adult intelligence; his autobiographical reminiscences; and a letter of 30 July 1819, written to Sir Samuel Bentham and subsequently lost. Somerville’s Mill Library and its marginalia provide an opportunity to anchor these otherwise indirect accounts in material evidence. 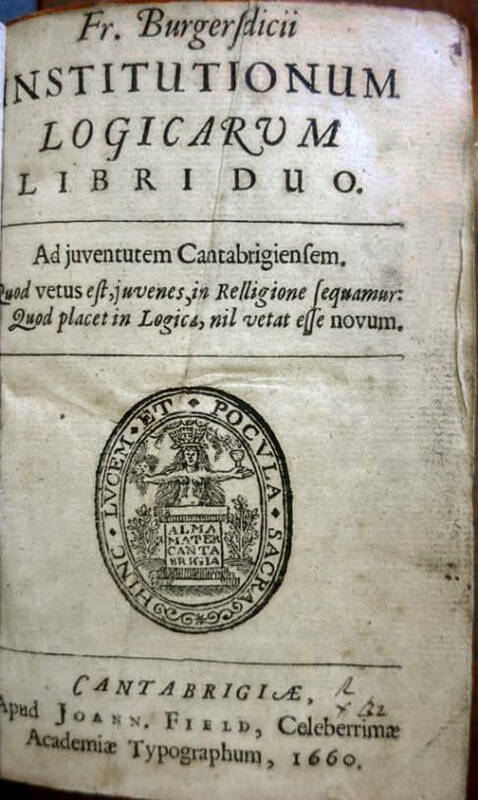 Among the books alluded to in Mill’s Autobiography, although not actually mentioned by either author or title, is Franco Burgersdijk’s Institutionum Logicarum, a seventeenth-century Latin handbook of neo-Aristotelian logic. Hundreds of its pages resemble p. 61, reproduced above, in featuring handwritten numbers in the outer margin. Initially inscrutable, these 575 numerical annotations turn out to be page numbers. 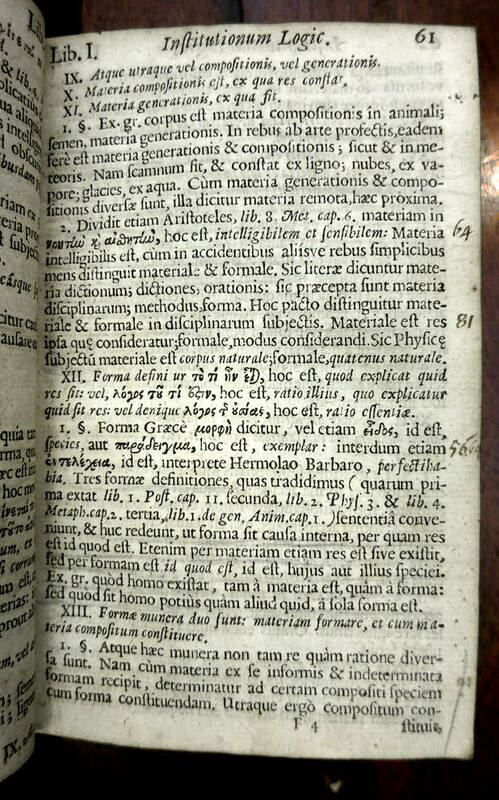 The previous year, Mill had been required by his father when reading Aristotle’s Rhetoric to “throw the matter of it into synoptic tables.” When, at age twelve, he had turned his attention to Aristotle’s Organon and other, unnamed “Latin treatises on the scholastic logic,” the young John Stuart appears to have recalled his earlier lesson by assembling a marginal cross-referenced index to Burgersdijk’s treatise. This mnemonic aid was likely designed to help him keep up with his father, who demanded, “each day . . . in our walks, a minute account of what I had read . . . answering his numerous and searching questions.” In so doing, Mill the child also left behind corroborating empirical signs of one of the most famous parts of his mental history. Together, Mill the editor, critic, researcher, friend, and student add emotional depth and a more personal dimension to the otherwise cerebral and somewhat inaccessible portrait that he cultivated in his public writing. They also provide important clues to the development of his thinking, to his methods of reading, and to portions of his life story about which he is otherwise reticent. Mill, John Stuart.The Collected Works of John Stuart Mill. Ed. John Robson, et. al. 33 vols. Tornoto: U of Tornoto P, 1963-91. Mill Marginalia Online. Ed. Albert D. Pionke and Emma Annette Wilson. Web. 18 April 2018. Prochaska, Frank. “Sense and Nonsense: John Stuart Mill’s Annotations on Ralph Waldo Emerson’s Essays.” History Today 63 (September 2013): 21-26.